It’s official: the next best thing after derby? Derby road trips! It was Northland Nightmares’ last game of the season (and our only away game) and last Saturday morning the Hells Wives team and dedicated supporters hit the road for the five hour haul to Tauranga to play Mt Militia Derby Crew‘s Dangerous Curves at Queen Elizabeth II Stadium. 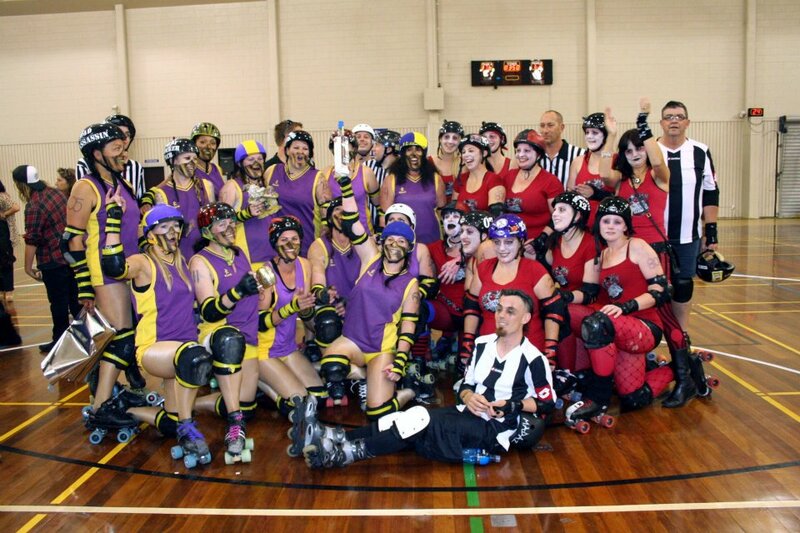 Thanks to the awesome Mt Militia Derby Crew for hosting us and a big thanks to our amazing Hells Wives Barmy Army (“we may ave bin small, but we were mighty”) for travelling down to support us! We can’t wait for the next derby road trip so rrrroll on next season! Hells Wives, Dangerous Curves and Zebra photo op! This entry was posted on November 13, 2011 by nnderby. It was filed under EVENTS! and was tagged with Dangerous Curves, Hells Wives, Mt Milita Derby Crew, Northland Nightmares, Northland Nightmares Roller Girls, Northland Nightmares Roller Girlz, Roller Derby.